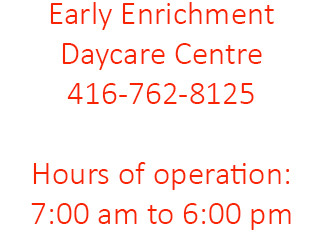 At Early Enrichment Day Care we provide a loving, safe environment in which each child is nurtured and encouraged to develop to their full potential. The early years of a child's life are a special and exciting time when children learn through play, observation and imitation. Our programs are designed to provide opportunities for developing social, cognitive, creative, emotional and physical skills, while encouraging self-control, self-esteem and self-reliance in each child. For more information please click here for the EEDC family policy handbook (pdf). We are located in St. John's Church West Toronto, 288 Humberside Avenue. We have four sunny classrooms plus a large gross motor skills room for kids to play in on rainy days. We have a supervised, fully fenced outdoor play area that offers children the chance to get outdoors and appreciate the natural surroundings. We have a seasoned staff that will provide your kids with a loving, safe environment so your child is nutured and encouraged to develop to their full potential. In each classroom, there is at least one teacher who holds a diploma in Early Childhood Education and is a member of the College of Early Childhood Educators. We have a cook on site who has her food handler certificate. We provide 2 healthy snacks and a hot lunch daily. We purchase our meats from Rowe Farms and fruits and vegetables from Young & Sons in Bloor West Village. We make efforts to purchase whole grain products, local and organic foods when possible.